For other uses, see Square the Circle and Squared circle. Squaring the circle: the areas of this square and this circle are both equal to π. In 1882, it was proven that this figure cannot be constructed in a finite number of steps with an idealized compass and straightedge. Some apparent partial solutions gave false hope for a long time. In this figure, the shaded figure is the Lune of Hippocrates. Its area is equal to the area of the triangle ABC (found by Hippocrates of Chios). Squaring the circle is a problem proposed by ancient geometers. It is the challenge of constructing a square with the same area as a given circle by using only a finite number of steps with compass and straightedge. It may be taken to ask whether specified axioms of Euclidean geometry concerning the existence of lines and circles entail the existence of such a square. In 1882, the task was proven to be impossible, as a consequence of the Lindemann–Weierstrass theorem which proves that pi (π) is a transcendental, rather than an algebraic irrational number; that is, it is not the root of any polynomial with rational coefficients. It had been known for some decades before then that the construction would be impossible if π were transcendental, but π was not proven transcendental until 1882. Approximate squaring to any given non-perfect accuracy, in contrast, is possible in a finite number of steps, since there are rational numbers arbitrarily close to π. The term quadrature of the circle is sometimes used to mean the same thing as squaring the circle, but it may also refer to approximate or numerical methods for finding the area of a circle. Methods to approximate the area of a given circle with a square, which can be thought of as a precursor problem to squaring the circle, were known already to Babylonian mathematicians. The Egyptian Rhind papyrus of 1800 BC gives the area of a circle as 64/81 d 2, where d is the diameter of the circle. In modern terms, this is equivalent to approximating π as 256/81 (approximately 3.1605), a number that appears in the older Moscow Mathematical Papyrus and is used for volume approximations (i.e. hekat). Indian mathematicians also found an approximate method, though less accurate, documented in the Shulba Sutras. Archimedes proved the formula for the area of a circle (A = πr2, where r is the radius of the circle) and showed that the value of π lay between 3 1/7 (approximately 3.1429) and 3 10/71 (approximately 3.1408). See Numerical approximations of π for more on the history. The first known Greek to be associated with the problem was Anaxagoras, who worked on it while in prison. Hippocrates of Chios squared certain lunes, in the hope that it would lead to a solution — see Lune of Hippocrates. Antiphon the Sophist believed that inscribing regular polygons within a circle and doubling the number of sides will eventually fill up the area of the circle, and since a polygon can be squared, it means the circle can be squared. Even then there were skeptics—Eudemus argued that magnitudes cannot be divided up without limit, so the area of the circle will never be used up. The problem was even mentioned in Aristophanes's play The Birds. It is believed that Oenopides was the first Greek who required a plane solution (that is, using only a compass and straightedge). James Gregory attempted a proof of its impossibility in Vera Circuli et Hyperbolae Quadratura (The True Squaring of the Circle and of the Hyperbola) in 1667. Although his proof was faulty, it was the first paper to attempt to solve the problem using algebraic properties of π. It was not until 1882 that Ferdinand von Lindemann rigorously proved its impossibility. A partial history by Florian Cajori of attempts at the problem. The first of these two misguided visionaries filled me with a great ambition to do a feat I have never heard of as accomplished by man, namely to convince a circle squarer of his error! The value my friend selected for Pi was 3.2: the enormous error tempted me with the idea that it could be easily demonstrated to BE an error. More than a score of letters were interchanged before I became sadly convinced that I had no chance. A ridiculing of circle-squaring appears in Augustus de Morgan's A Budget of Paradoxes published posthumously by his widow in 1872. Having originally published the work as a series of articles in the Athenæum, he was revising it for publication at the time of his death. Circle squaring was very popular in the nineteenth century, but hardly anyone indulges in it today and it is believed that de Morgan's work helped bring this about. The solution of the problem of squaring the circle by compass and straightedge requires the construction of the number √π. If √π is constructible, it follows from standard constructions that π would also be constructible. In 1837, Pierre Wantzel showed that lengths that could be constructed with compass and straightedge had to be solutions of certain polynomial equations with rational coefficients. Thus, constructible lengths must be algebraic numbers. If the problem of the quadrature of the circle could be solved using only compass and straightedge, then π would have to be an algebraic number. Johann Heinrich Lambert conjectured that π was not algebraic, that is, a transcendental number, in 1761. He did this in the same paper in which he proved its irrationality, even before the general existence of transcendental numbers had been proven. It was not until 1882 that Ferdinand von Lindemann proved the transcendence of π and so showed the impossibility of this construction. The transcendence of π implies the impossibility of exactly "circling" the square, as well as of squaring the circle. It is possible to construct a square with an area arbitrarily close to that of a given circle. If a rational number is used as an approximation of π, then squaring the circle becomes possible, depending on the values chosen. However, this is only an approximation and does not meet the constraints of the ancient rules for solving the problem. Several mathematicians have demonstrated workable procedures based on a variety of approximations. Bending the rules by allowing an infinite number of compass-and-straightedge operations or by performing the operations in certain non-Euclidean geometries also makes squaring the circle possible in some sense. For example, although the circle cannot be squared in Euclidean space, it sometimes can be in hyperbolic geometry under suitable interpretations of the terms. As there are no squares in the hyperbolic plane, their role needs to be taken by regular quadrilaterals, meaning quadrilaterals with all sides congruent and all angles congruent (but these angles are strictly smaller than right angles). There exist, in the hyperbolic plane, (countably) infinitely many pairs of constructible circles and constructible regular quadrilaterals of equal area, which, however, are constructed simultaneously. There is no method for starting with a regular quadrilateral and constructing the circle of equal area, and there is no method for starting with a circle and constructing a regular quadrilateral of equal area (even when the circle has small enough radius such that a regular quadrilateral of equal area exists). 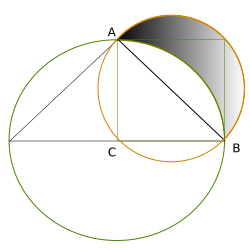 Though squaring the circle is an impossible problem using only compass and straightedge, approximations to squaring the circle can be given by constructing lengths close to π. It takes only minimal knowledge of elementary geometry to convert any given rational approximation of π into a corresponding compass-and-straightedge construction, but constructions made in this way tend to be very long-winded in comparison to the accuracy they achieve. After the exact problem was proven unsolvable, some mathematicians applied their ingenuity to finding elegant approximations to squaring the circle, defined roughly and informally as constructions that are particularly simple among other imaginable constructions that give similar precision. Among the modern approximate constructions was one by E. W. Hobson in 1913. This was a fairly accurate construction which was based on constructing the approximate value of 3.14164079..., which is accurate to 4 decimals (i.e. it differs from π by about 6995480000000000000♠4.8×10−5). which is accurate to six decimal places of π.
giving eight decimal places of π. He describes his construction till line segment OS as follows. Let AB (Fig.2) be a diameter of a circle whose centre is O. Bisect the arc ACB at C and trisect AO at T. Join BC and cut off from it CM and MN equal to AT. Join AM and AN and cut off from the latter AP equal to AM. Through P draw PQ parallel to MN and meeting AM at Q. Join OQ and through T draw TR, parallel to OQ and meeting AQ at R. Draw AS perpendicular to AO and equal to AR, and join OS. Then the mean proportional between OS and OB will be very nearly equal to a sixth of the circumference, the error being less than a twelfth of an inch when the diameter is 8000 miles long. In this quadrature, Ramanujan did not construct the side length of the square, it was enough for him to show the line segment OS. In the following continuation of the construction, the line segment OS is used together with the line segment OB to represent the mean proportionals (red line segment OE). Extend AB beyond A and beat the circular arc b1 around O with radius OS, it results in S′. Bisect the line segment BS′ in D and draw the semicircle b2 over D. Draw a straight line from O through C up to the semicircle b2, it cuts b2 in E. The line segment OE is the mean proportional between OS and OB, also called geometric mean. Extend the line segment EO beyond O and transfer EO twice more, it results F and A1, and thus the length of the line segment EA1 with the above described approximation value of π, the half circumference of the circle. Bisect the line segment EA1 in G and draw the semicircle b3 over G. Transfer the distance OB from A1 to the line segment EA1, it results H. Create a vertical from H up to the semicircle b3 on EA1, it results B1. Connect A1 to B1, thus the sought side a of the square A1B1C1D1 is constructed, which has nearly the same area as the given circle. (Kochański's approximation), though these were only accurate to four decimal places of π.
seven decimal places are equal to those of √π respectively equal to those of π. Finding the area under a curve, known as integration in calculus, or quadrature in numerical analysis, was known as squaring before the invention of calculus. Since the techniques of calculus were unknown, it was generally presumed that a squaring should be done via geometric constructions, that is, by compass and straightedge. For example, Newton wrote to Oldenburg in 1676 "I believe M. Leibnitz will not dislike the Theorem towards the beginning of my letter pag. 4 for squaring Curve lines Geometrically" (emphasis added). After Newton and Leibniz invented calculus, they still referred to this integration problem as squaring a curve. The mathematical proof that the quadrature of the circle is impossible using only compass and straightedge has not proved to be a hindrance to the many people who have invested years in this problem anyway. Having squared the circle is a famous crank assertion. (See also pseudomathematics.) In his old age, the English philosopher Thomas Hobbes convinced himself that he had succeeded in squaring the circle. Montucla says, speaking of France, that he finds three notions prevalent among cyclometers: 1. That there is a large reward offered for success; 2. That the longitude problem depends on that success; 3. That the solution is the great end and object of geometry. The same three notions are equally prevalent among the same class in England. No reward has ever been offered by the government of either country. Although from 1714 to 1828 the British government did indeed sponsor a £20,000 prize for finding a solution to the longitude problem, exactly why the connection was made to squaring the circle is not clear; especially since two non-geometric methods (the astronomical method of lunar distances and the mechanical chronometer) had been found by the late 1760s. De Morgan goes on to say that "[t]he longitude problem in no way depends upon perfect solution; existing approximations are sufficient to a point of accuracy far beyond what can be wanted." In his book, de Morgan also mentions receiving many threatening letters from would-be circle squarers, accusing him of trying to "cheat them out of their prize". Even after it had been proved impossible, in 1894, amateur mathematician Edwin J. Goodwin claimed that he had developed a method to square the circle. The technique he developed did not accurately square the circle, and provided an incorrect area of the circle which essentially redefined pi as equal to 3.2. Goodwin then proposed the Indiana Pi Bill in the Indiana state legislature allowing the state to use his method in education without paying royalties to him. The bill passed with no objections in the state house, but the bill was tabled and never voted on in the Senate, amid increasing ridicule from the press. The problem of squaring the circle has been mentioned by poets such as Dante and Alexander Pope, with varied metaphorical meanings. Its literary use dates back at least to 414 BC, when the play The Birds by Aristophanes was first performed. In it, the character Meton of Athens mentions squaring the circle, possibly to indicate the paradoxical nature of his utopian city. For Dante, squaring the circle represents a task beyond human comprehension, which he compares to his own inability to comprehend Paradise. Now, running round the circle, finds it square. Similarly, the Gilbert and Sullivan comic opera Princess Ida features a song which satirically lists the impossible goals of the women's university run by the title character, such as finding perpetual motion. One of these goals is "And the circle – they will square it/Some fine day." The sestina, a poetic form first used in the 12th century by Arnaut Daniel, has been said to square the circle in its use of a square number of lines (six stanzas of six lines each) with a circular scheme of six repeated words. Spanos (1978) writes that this form invokes a symbolic meaning in which the circle stands for heaven and the square stands for the earth. A similar metaphor was used in "Squaring The Circle", a 1908 short story by O. Henry, about a long-running family feud. In the title of this story, the circle represents the natural world, while the square represents the city, the world of man. In James Joyce's novel Ulysses, Leopold Bloom dreams of becoming wealthy by squaring the circle, unaware that the quadrature of the circle had been proved impossible 22 years earlier and that the British government had never offered a reward for its solution. In Thomas Mann's The Magic Mountain, Lawyer Paravant is tragically obsessed with squaring the circle, probably in response to a failed love affair. He becomes lost in his "obsessive attempt to square the circle, an impossible operation which he believes he will be able to perform at the Berghof, because of the sanitarium's vertiginous elevation above the 'flatland'". His endeavour "takes a dissipatory turn, and is eventually denounced at the sanitarium as 'mystic hocus-pocus'". The two other classical problems of antiquity were doubling the cube and trisecting the angle, described in the compass and straightedge article. Unlike squaring the circle, these two problems can be solved by the slightly more powerful construction method of origami, as described at mathematics of paper folding. For a more modern related problem, see Tarski's circle-squaring problem. The Indiana Pi Bill, an 1897 attempt in the Indiana state legislature to dictate a solution to the problem by legislative fiat. Squircle, a mathematical shape with properties between those of a square and those of a circle. ^ Ammer, Christine. "Square the Circle. Dictionary.com. The American Heritage® Dictionary of Idioms". Houghton Mifflin Company. Retrieved 16 April 2012. ^ O'Connor, John J. & Robertson, Edmund F. (2000). "The Indian Sulbasutras". MacTutor History of Mathematics archive. St Andrews University. ^ Heath, Thomas (1981). History of Greek Mathematics. Courier Dover Publications. ISBN 0-486-24074-6. ^ Florian Cajori (1919). A History of Mathematics (2nd ed.). New York: The Macmillan Company. p. 143. ^ Martin Gardner (1996). The Universe in a Handkerchief. Springer. ISBN 0-387-94673-X. ^ Dudley, Underwood (1987). A Budget of Trisections. Springer-Verlag. pp. xi–xii. ISBN 0-387-96568-8. Reprinted as The Trisectors. ^ Wantzel, L. (1837). "Recherches sur les moyens de reconnaître si un problème de géométrie peut se résoudre avec la règle et le compas" [Investigations into means of knowing if a problem of geometry can be solved with a straightedge and compass]. Journal de Mathématiques Pures et Appliquées (in French). 2: 366–372. ^ Cajori, Florian (1918). "Pierre Laurent Wantzel". Bull. Amer. Math. Soc. 24 (7): 339–347. doi:10.1090/s0002-9904-1918-03088-7. MR 1560082. ^ Lambert, Johann Heinrich (1761). "Mémoire sur quelques propriétés remarquables des quantités transcendentes circulaires et logarithmiques" [Memoir on some remarkable properties of circular transcendental and logarithmic quantities]. Histoire de l'Académie Royale des Sciences et des Belles-Lettres de Berlin (in French) (published 1768). 17: 265–322. ^ Lindemann, F. (1882). "Über die Zahl π" [On the number π]. Mathematische Annalen (in German). 20: 213–225. ^ Jagy, William C. (1995). "Squaring circles in the hyperbolic plane" (PDF). Mathematical Intelligencer. 17 (2): 31–36. doi:10.1007/BF03024895. ^ Greenberg, Marvin Jay (2008). Euclidean and Non-Euclidean Geometries (Fourth ed.). W H Freeman. pp. 520–528. ISBN 0-7167-9948-0. ^ Hobson, Ernest William (1913). Squaring the Circle: A History of the Problem. Cambridge University Press. Reprinted by Merchant Books in 2007. ^ Cotes, Roger (1850). Correspondence of Sir Isaac Newton and Professor Cotes: Including letters of other eminent men. ^ Augustus de Morgan (1872). A Budget of Paradoxes. p. 96. ^ Amati, Matthew (2010). "Meton's star-city: Geometry and utopia in Aristophanes' Birds". The Classical Journal. 105 (3): 213–222. doi:10.5184/classicalj.105.3.213. JSTOR 10.5184/classicalj.105.3.213. ^ Herzman, Ronald B.; Towsley, Gary B. (1994). "Squaring the circle: Paradiso 33 and the poetics of geometry". Traditio. 49: 95–125. JSTOR 27831895. ^ Schepler, Herman C. (1950). "The chronology of pi". Mathematics Magazine. 23: 165–170, 216–228, 279–283. doi:10.2307/3029284. JSTOR 3029832. MR 0037596. ^ Dolid, William A. (1980). "Vivie Warren and the Tripos". The Shaw Review. 23 (2): 52–56. JSTOR 40682600. Dolid contrasts Vivie Warren, a fictional female mathematics student in Mrs. Warren's Profession by George Bernard Shaw, with the satire of college women presented by Gilbert and Sullivan. He writes that "Vivie naturally knew better than to try to square circles." ^ Spanos, Margaret (1978). "The Sestina: An Exploration of the Dynamics of Poetic Structure". Speculum. 53 (3): 545–557. doi:10.2307/2855144. JSTOR 2855144. ^ Bloom, Harold (1987). Twentieth-century American literature. Chelsea House Publishers. p. 1848. ISBN 9780877548034. Similarly, the story "Squaring the Circle" is permeated with the integrating image: nature is a circle, the city a square. ^ Pendrick, Gerard (1994). "Two notes on "Ulysses"". James Joyce Quarterly. 32 (1): 105–107. JSTOR 25473619. ^ Goggin, Joyce (1997). The Big Deal: Card Games in 20th-Century Fiction (PhD). University of Montréal. p. 196.